Newborn rabbits are just about the most adorable animal babies there are, but you should never let your dwarfs continually reproduce. In pedigreed dwarf rabbits, it is essential to maintain the standard, which means that you must acquire a basic knowledge of genetics. Also, if you would later like to show your animals and have them judged, you must become a member of a rabbit breeder’s club. Only registered club members may take part in shows. Whether it is a purebred or a mixed breed, however, you should have a home for every kit before you even consider breeding. Both parents should be healthy and have no physical defects that could be genetically passed on. The ideal breeding age is between eight months and four years. The indoor cage must have a surface area of at least 39 x 24 inches (100 x 60 cm), so that the kindling house will fit in and there will be enough room for the baby rabbits. Any cohabitants of the cage, such as another rabbit or a guinea pig, should be removed to a separate cage for the next three to four months. The doe needs peace and quiet now or she will possibly reject her young by scattering them around the cage, instead of tucking them into the nest. The doe’s readiness to mate occurs during estrus, or heat. House rabbits can be in heat all year long. A doe in heat can be recognized because when she is being scratched she raises her pelvis. Also, the labia are slightly reddened and swollen. Some does collect hay in their mouths as if they intend to build a nest. The mat­ing ritual and copulation take the most natural course when the two rabbits have enough space so that they can approach each other without stress. It is better to take the doe to the buck, as in her own territory, the doe will regard the buck as an intruder and might attack him. Copulation itself takes only a few seconds. The doe presses herself flat against the ground and raises the back of her pelvic area. This facilitates the buck’s penetration. After successful copulation the buck usually slides to the side of the doe with a brief growling sound and lies there exhausted for a few seconds. After 10 to 12 hours, ovulation is triggered and the eggs are fertilized by the sperm. You can tell if your rabbit is pregnant by her behavior. She is now more aggressive with any fellow cage-dwellers and can even show nervous behavior with you. She also scratches diligently in the litter and churns it up, which is normal behavior. The pregnancy lasts from the day of fertiliza­tion until the birth, for 31 days on average (28 to 33 are possible). Write down the day of the mating, so you can calculate the birth date approximately. The house cage where the doe lives must not be moved or changed at all for any reason during the pregnancy. Make sure that the doe is not dis­turbed and avoid picking up or carrying the ani­mal. As an exception to this, nails that are too long must now be trimmed to prevent any danger of injury to the young later. About one week before the birth, clean the cage thoroughly. Put a little house in it for the kits, and line it with plenty of fresh straw. The house should have a surface area of 14 x 10 inches (35 x 25 cm), be 9 inches (23 cm) high, and a removable roof. The diameter of the entry hole should be about 5 inches (12 cm). Several days before the birth the doe will pull fur from her abdomen and cushion the nest with it to make a warm bed for her kits. 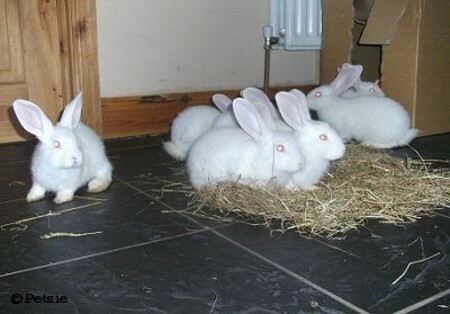 A dwarf rabbit bears an average of three to four young. You might not be aware of the birth of the little ones at all, as the rabbits bring their young into the world very quietly. Immediately after the birth, the doe licks her helpless little ones clean, bites through the umbilical cords, and eats the afterbirths, so that the nest remains clean. Very soon after birth, the young instinctively find their mother’s teats and drink milk.